When I was finishing PT school in the mid/late 90s, “functional” was all the rage. The idea was to train people in ways that simulate their desired tasks. By doing this, you would achieve the best results because you are training the muscles to engage and be strong during the activities that matter. This made so much sense to me back then that I jumped in with both feet. As a strength and conditioning specialist, I knew all the “basic” lifts (BOR-ing), but that stuff was too simple and the movements too restricted. They were far from functional – not enough “core” (whatever THAT is). I didn’t need those exercises. All I needed was some dumbbells, a physioball, some elastic bands, and my creativity!!! The last thing I needed were exercise machines with their weight stacks and pins and single planes. Ugh. Brainless. Function was the answer. I focused on golfers at first. I had a friend who was around my age and a golf professional. I had done a ton of study on the mechanics of the “right” golf swing and decided to break it into its components of rotation. Everything was trained with a multi-plane “functional” approach whether it was glutes, hams, shoulders, or the “core”. I kept the weight just light enough so that he could perform the desired movements exactly as I wanted – no compensations. “I’m going to make you hit a golf ball better,” was my reply. Well, the customer is always right so I put together an “old school” program of cleans, squats, bench press, etc. Whatever, I’ll sneak in some functional stuff as well. Since I worked the two at the same time, my original guy also switched over to the same program. I trained them all off-season varying their loads into periodization phases but essentially did the same brainless exercises. I have to admit, I pushed them pretty hard and they became significantly stronger in every exercise. Then came the season and the start of the tournaments. The first event was called “The Icebreaker” since it happened just before the temperatures start to really rise in the spring. Most of the pros had only a couple weeks of practice rounds beforehand. Just before the tournament I had the guys do a final light workout. My friend invited me to walk the tournament with the two of them. I was confused as to why. “You’ll see,” he said with a smirk. The two of them DESTROYED the field. The same guys that played against them the season before were baffled. What happened to THESE two guys? That next Monday the guys showed up for their 5am workout (they had to be at the golf course by 6:30am in the spring/summer). They weren’t alone. They had several other pros with them who wanted whatever it was I was cooking at my little training facility. As the season went on, amateurs started showing up to train with the pros. During one workout, one of the amateurs noted that he was doing this so he could drive it 300 yards. I started to agree with him when one of my original guys interrupted me. “The difference in the drive means little. Besides,” he continued, “these big guns you’ve given me really intimidate the rest of the competition at tee-off.” He then kissed his biceps and returned to the squat rack. I looked back at the amateur and shrugged. I worked with this crew for a couple years. Over that time I focused less on the specificity of the movement and more on the specificity of the metabolic system (the golf swing is a power movement). Their 1-rep-max (1RM) for bench press got in the 275lb neighborhood and back squats 1RMs were up near 400lbs. Trust me, that’s a huge improvement from where they started. As the years went on, I slowly lost my faith in “functional” exercises. Now I believe that “functional” exercises are essentially useless because they aren’t the best tools to achieve the true goals of the weight room. When you think about the goals of the weight room, they are not to increase function directly. They are to increase the capacity of the muscles. Those are two very different concepts. Capacity refers to the ability of a muscle to do work. Function would be the performance of a desired task itself. The most functional task an athlete can perform is the sport itself. You see, it turns out that there is essentially no such thing as functional carry-over from an exercise to a task – not in a motor learning way at least. The only thing that makes you directly better at the skill of performing a task is practicing the specific task itself. In other words, if you want to swing a golf club better, practice swinging a golf club. So does weight training do nothing? Actually it does a lot, but not in a skill transfer way. When someone swings a golf club, there are certain actions required of the muscles. Hamstrings and lower quarter need to generate force. 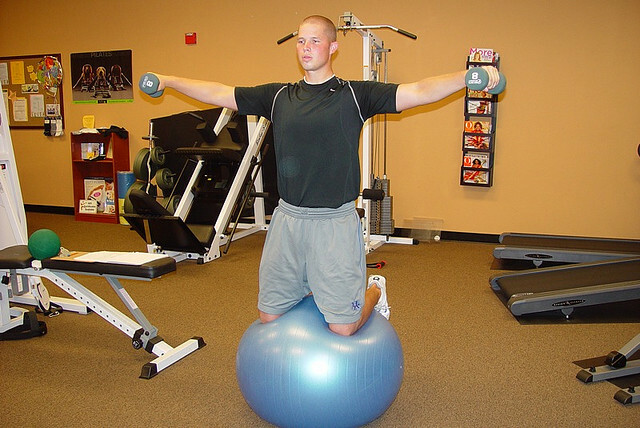 The “core” (dumb word) and shoulder musculature need to transfer those forces. The wrist and hand muscles need to engage to direct those forces into the club and ultimately to the ball. Now, if I go work with a golf professional to practice my golf swing (I never would because golf is a stupid game and not even a sport) they will be demanding a certain amount of performance out of those muscles as they trained the skill. If those muscles do not have the capacity required to perform the task, they cannot perform the task. Duh. If, for example, my rotator cuff does not have enough capacity to transfer the load generated by my lower quarter I will have a failure at the shoulder. I may even get some pain because of it. So how would I fix that? LOAD THE MUSCLE YOU MORON! That’s it. Now is the best way to load that muscle to try to engage it in some “functional” position simulating the golf swing? Well, that will load it somewhat, but that is not going to create the most load. Just lock it out, don’t allow other muscles to help (in other words, isolate it), and work that sucker. It’s not that complicated no matter how much you want it to be. Once capacity improves, I can head back to the golf professional and, lo and behold, swinging a golf club is easier, but not because my skill has improved. I simply have more strength to engage during the task. Does that mean those “functional” exercises do NOTHING??? No, but they are probably not doing what you think they are doing. The performance improvement achieved though “functional” exercises is most likely due more to the secondary capacity gains than the “neural pathway development” or whatever. This is especially true in a rehab application when the weakness can be extreme. ANY load to the muscle will be an improvement, even if it isn’t optimal. Knowing what is actually effective about what you do, helps you focus on and maximize what is effective. That doesn’t mean these “functional” exercises are doing anything more than building capacity. But, if the goal is to build capacity, there are much better ways to go about that. By all means, use that brain of yours to explore new ways to load a muscle. Periodization tells us that the more different ways we load the muscle, the better the strength adaptation. Just remember that the goal is first and foremost to load that muscle. Ask yourself, “How can I apply the most load to the desired muscle?” and do that. If the exercise that you have provided makes the subject say, “Wow! That really hits my (whatever muscle you are targeting),” then your exercise is a good one. The focus is directly developing capacity. The simpler the better. Keep in mind, those classic lifts are considered classic for a reason. If your goal is to improve the skill of the task, you must do the task itself, not a simulation. Squats beget squats. Lunges beget lunges. Running begets running. So on and so forth. Give the subject the capacity to perform the task. Let the coaches develop the skill.